LOS ANGELES - December 6, 2018" Jaguar Land Rover is offering consumers a special experience at this year’s LA Auto Show. With its largest footprint ever on the auto show floor, all the latest Jaguar and Land Rover models are on display and the space is staffed with helpful product specialists ready to answer all your questions. There’s also a few interactive elements including an augmented reality experience, street test drives and an off-road driving course set up right there in Downtown Los Angeles where consumers can experience the incredible capability of Land Rover’s luxury SUVs. To learn more we spoke to Michael Curmi, the director of brand experience at Jaguar Land Rover. What will consumers experience at the extensive Jaguar Land Rover auto show stand? We have the full Jaguar Land Rover lineup on display at our stand this year. We have a great variety and we are fully staffed with product specialists prepared to answer questions, and discuss and showcase how our vehicles fit into your lifestyle. On the Jaguar side we have a few interactive elements. We have the all-new all-electric I-PACE and we’re doing some special walk-arounds, so people can get a private tour of the vehicle with a product specialist and enjoy some one on one time. We encourage attendees to spend as much time as they would like crawling in and around the vehicles to experience their luxury and features. We also have a virtual reality experience that focuses on our Formula E racing series, so people can enjoy competing with each other and getting a score and a take away for participating in the VR experience. For the first time we also have a virtual reality cat, a Jaguar that people can move around with in the space. The cat will actually interact with participants who can then take home a video of the experience that they can share with friends and family on social media. Can the product specialists at the auto show walk people through the unique technology of the Jaguar I-PACE? Yes, absolutely. Each of the product experts is fully trained on the all-electric technology of the vehicle and we also have visual aids to better help consumers understand range and how to find charging stations and how an electric vehicle can fit into your life. Are you highlighting the drive elements of Jaguar and Land Rover this year? With Jaguar and Land Rover, it’s not just static displays at the LA Auto Show. We’re also promoting our drives and encourage people to get in the vehicles and really experience them the way they should be experienced. People can sign up for any of our three Land Rover Experience Centers and driving schools across the country. Both brands are also doing street test drives right here in front of the convention center on Figueroa St, and we’ve brought in dozens of dump trucks full of dirt and shaped up an actual off road course right here in Downtown Los Angeles where you can take one of our Land Rovers for an off road drive. It’s a lot of fun. We did it for the first time last year and it was so popular we brought it back. In December, we have drives coming back to Barker Hanger in Santa Monica for the Jaguar Electrifies Tour, beginning December 13. Consumers will have the chance to test drive the all-new I-PACE. 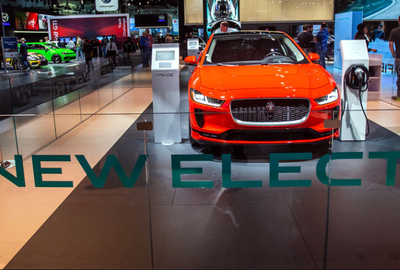 To sign up for the Jaguar Electrifies tour in Santa Monica, click here. Are they any special activities for current Jaguar Land Rover owners? We have a comfortable owners lounge at back of the stand. All you have to show is the key to your Jaguar or Land Rover vehicle, and you can enjoy some light food and beverages. We’ll also have a barber on site so you can get a hot shave and a trim and some light massages. We know it can be tiring walking around the show and we’re happy to do that for our owners. We also have some notable local personalities coming in to meet our owners. It’s a variety of well-known fitness instructors, chefs and authors to do book signing and autographs. They will be there primarily on the weekend.